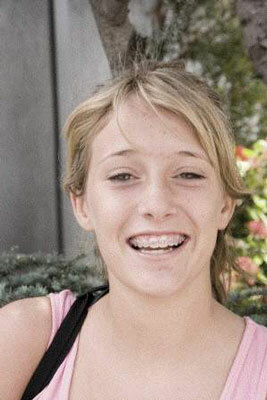 Sometimes you may want to convert an image to bitmap mode in Photoshop Elements. Bitmap mode is most commonly used in printing line art, such as black-and-white logos, illustrations, or black-and-white effects that you create from your RGB images. Also, you can scan your analog signature as a bitmap image and import it into other programs, such as the Microsoft Office applications. If you’re creative, you can combine bitmap images with RGB color to produce many interesting effects. One important thing to keep in mind is that when you combine images into single documents, you need to convert bitmap files to grayscale or color if you want to merge the images with an RGB image. If you convert to grayscale, Elements takes care of converting grayscale to RGB mode. 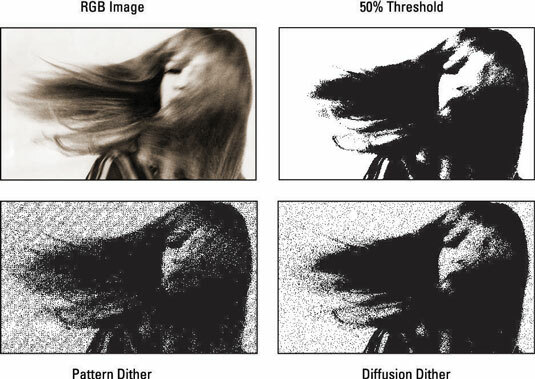 As an example of an effect resulting from combining grayscale and color images, look at this figure. The original RGB image was converted to a bitmap and then saved as a different file. The bitmap was converted to grayscale and dropped on top of the RGB image. After you adjust the opacity, the result is a grainy effect with desaturated color. You can acquire Bitmap mode images directly in Elements when you scan images that are black and white. Illustrated art, logos, your signature, or a copy of a fax might be the kinds of files you scan directly in Bitmap mode. Additionally, you can convert your images to Bitmap mode. Converting RGB color to bitmap is a two-step process. You need to first convert to grayscale and then convert from grayscale to bitmap. If you select the Bitmap menu command while in RGB color, Elements prompts you to convert to grayscale first. The Photoshop Elements Bitmap mode isn’t the same as the Windows .bmp file format. In Elements, Bitmap mode is a color mode. A Windows .bmp file can be an RGB color mode image, a Grayscale color mode image, or a Bitmap color mode image. In the Photo Editor workspace, open an image that you want to convert to Bitmap mode in either Expert or Quick mode. If you start in RGB mode, Elements prompts you to convert to grayscale. At the prompt, if you see it, click OK. 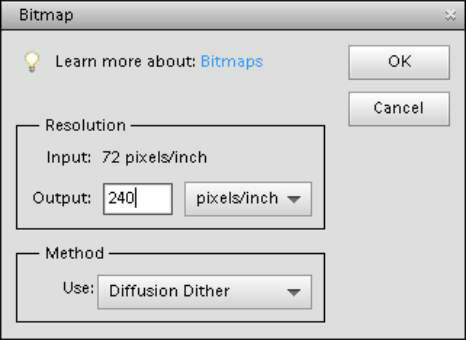 The Bitmap dialog box opens and provides options for selecting the output resolution and a conversion method. By default, the Bitmap dialog box, shown in the figure, displays the current resolution. You can edit the Output box and resample the image or accept the default. From the Use drop-down menu, select a method for converting an RGB image to a bitmap image. The figure shows the effect each method creates. Click OK to convert your image to Bitmap mode.